Join Orange County area businesses, chambers of commerce, and professional business organizations for Orange County's largest and longest running B2B marketing & networking event. 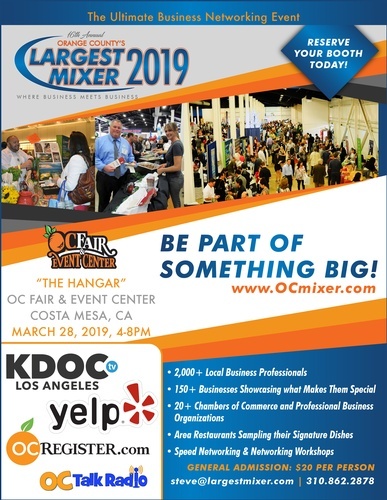 Connect with 150+ exhibitors and 2000 businessmen and women representing dozens of companies in Orange County and around Southern California. The 16th annual Orange County's Largest Mixer is a great opportunity meet new clients and gain new sales leads. Warm up your handshake and polish-up your business cards! OC Fair & Event Center.